Miracles: What they are, why they matter, and how they can change your life. This book is one of those rare books that will be added to my all-time favorites list. In the first half of the book Metaxas presents the subjects of miracles, faith, and Christianity (whether they are fact or fiction) in such a way that they can be understood by anyone, yet he is not patronizing, simplistic, or preachy. In the second half of the book he provides a “lab” section providing different examples which potentially demonstrate the reality of miracles (you read it and decide for yourself). Being convinced of the reality of miracles before reading the book, I almost skipped the second half of the book, not needing any of the “mushy stuff”. I’m so glad I didn’t. Some of Metaxas’ accounts literally jerked tears out of my eyes and strengthened my faith immensely. Bottom line, in my humble opinion, “Miracles” is truly an inspiring book; a must read. And by the way, Metaxas has a daily radio program that you can listen too via his podcast (I get it off iTunes) which is a real winner…through (Metaxas if you happen to read this) I wish he’d cool his jets and let his guests talk a little more. As you can see, I’m pretty high on Metaxas, and for the record, I am not his mother writing under a “pseudonym”; through I do like Greek food. 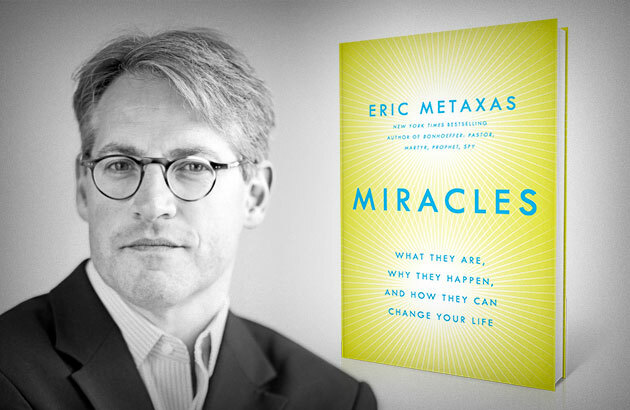 Tags: Eric Metaxas, Miracles. Bookmark the permalink.